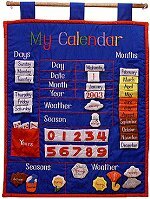 With this interactive My Calendar cloth wall hanging, your child will learn more than just the days of the week. Complete with months, seasons, weather, and more, learning with My Calendar will delight children of all ages. This adorable soft sculpture educational My Calendar wall hanging comes with beautifully embroidered detail and cloth pieces to help make learning an interactive delight.